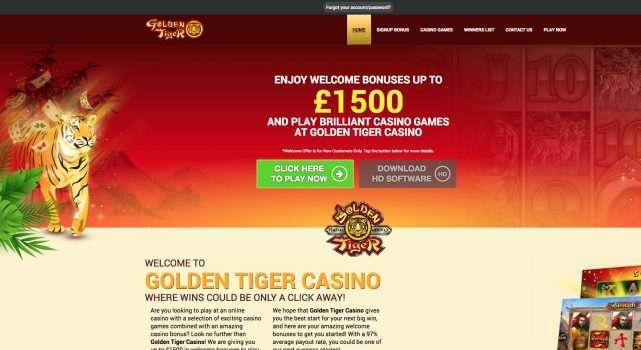 Read this Golden Tiger casino review in order to know everything about it! Want to know if Golden Tiger worth your attention? You’ve come to the right place. We have analyzed many factors to write this review so you won’t be disappointed with the result. Let’s go! Golden Tiger is a quite old casino. It was established in 2000, and it has gained much reputation since then – it has quite high ratings, and although it’s not the best casino in the world, it’s still the place you can’t miss if you like slots, table games or poker. The Casino Rewards Group is the owner of this casino, and they are one of the oldest and most reputable Casino groups in the Internet. All their casinos are very good (like Casino Action, Challenge Casino, Grand Hotel and Nostalgia casinos) – and Golden Tiger isn’t an exception. First of all, Golden Tiger is safe – this casino is licensed and certified well so safety and transparency are not the problem. The website is encrypted by the latest version of SSL technology, of course. They also have a very good support service with round-the-clock live chat, toll-free numbers and fast email support, so if you have any problems, they will be solved as soon as possible. Another advantage of this casino is that there are about 500 games and all of them are developed by Microgaming. As you probably know, Microgaming is one of the best casino games providers, so you don’t need to worry – the games here are exciting and fair, and your experience will be perfect. However, some players complain that there are some problems with the withdrawals and with some bonuses. It was a very short review to make it clear for you – and now we will talk about all the advantages and disadvantages of Golden Tiger casino in details. Golden Tiger bonuses. What about free spins? Unfortunately, the Golden Tiger online casino doesn’t offer any free spins (as well as no deposit bonuses). However, there are many other interesting bonuses in this casino, so you will not be disappointed anyway. Thus, there is a usual welcome bonus, and it’s great. You can get 100% of your first deposit as bonus money – but not more than $100. Of course, this bonus is cashable and can be cashed out once the requirements are completed. You can get 50% of your second bonus (up to $300), 20% of your third one (up to $500), 30% of your fourth deposit ($500) and 100% of the fifth deposit you make (not more than $100). It means that in total, you can get up to $1500 as bonuses! According to the bonus terms at the Golden Tiger’s website, the wagering requirements are quite high. Thus, if you want to withdraw the first welcome bonus (100% of your first deposit), this number will be 60 which means you’ll have to wager $6,000! The wagering requirements for the other bonuses are not as high (30x). You should also remember that different games have different wagering contribution. It means that, if you deposit $100 and get a bonus $100, you will have to wager $6,000 on slot machines and Parlor games, because these games have 100% contribution. The other games, like table poker, have 50% contribution, which means you’ll need to wager $12,000 to cash the bonus out. The situation is even worse if you play blackjack (these games count 10%, so you’ll need to wager $60,000 to withdraw the $100 bonus!). Aces Video Poker games don’t count at all. One more tip: the maximum wage is 25% of the bonus, so you can’t wage more than $25 if your bonus is $100, for example. Playing in Golden Tiger isn’t legit in the United States. What about other countries, like Canada or the United Kingdom? Well, the very first thing for you to know: this casino is licensed in Kahnawake. This jurisdiction does usually mean that the casino is not restricted in Canada, but the American players very often can’t play in such casinos. Golden Tiger isn’t an exception. It’s not a problem to play in this casino if you are from Canada or from the United Kingdom. The same is for the players from Germany, Russia, China and hundreds of other countries. However, the players from the United States of America, France, Spain, and some other countries are not allowed to play here. Well, it’s not a problem – if you are from a restricted country, you can always use VPN or proxy. The withdrawal limits are not very high. You can’t withdraw less than $50 and more than $4,000 per week (of course if it’s not a progressive win). As for the banking options – well, there are many of them. You can use credit or debit card, electronic wallets, Neteller, Skrill, direct bank transfer, Euteller, uNet, PayPal, InstaDebit, UKash and many other options to withdraw your money. The withdrawals will not take too much time – 24-48 hours for electronic wallets, 3-5 days for credit cards, 6-10 days for the direct bank payments. However, the pending time is quite long (24-48 hours) and some people complain that sometimes it may take up to a few weeks to get their money. Well, this problem is still not very often and it seems like it can happen only if it’s your first or second withdrawal. As we’ve already mentioned, Golden Tiger casino is licensed by Kahnawake authorities. This jurisdiction is quite reputable and trusted – there are more than 100 casinos with such Kahnawake licenses and they’ve been doing it since 1996. Such licenses mean that all the games in a casino are fair, all the random results are really random, and that all the winners will be paid, with no exceptions. Golden Tiger casino does also have an eCogra certificate – and it means that the customers are protected, as well as their private and financial information, that no frauds are possible, that privacy is secured and that the games in a casino are fair. All in all, Kahnawake license and Golden Tiger certificate mean that you don’t need to worry anymore – even if you have any problems, they will be solved according to the laws. But it’s much more likely that everything will be fine, so we can recommend you to try this casino.